…Arguably it was not the best kind of book to be reading at Christmas time, when family is clamouring around and demanding your already much-divided attention (‘look at this Barbie! It speaks Spanish!’; ‘mince pie?’; ‘The Queen’s Speech is on’ etc, etc. ), but, then again, perhaps it was the perfect anecdote and escape to all that chaos. Originally published in 1970, it is the first in O’Brian’s very famous and much lauded series of naval adventures centred on the irrepressible Captain Jack Aubrey and his friend, naval surgeon Dr. Stephen Maturin. It begins in April 1800, in Port Mahon in Minorca, just as Aubrey -, garrulous, somewhat plump and a Tory – meets and befriends Stephen Maturin - half-Irish, ‘cadaverous’ and a natural philosopher - and is given his first command as Captain of the sloop Sophie. 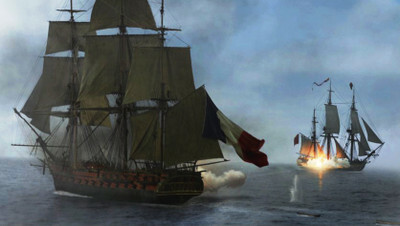 Further awarded the opportunity of a ‘cruise’ - a prize-hunting mission along the coast of Spain likely to enrich him and his crew immeasurably - Aubrey offers Maturin a place on board the Sophie as ship’s surgeon, and soon embarks on a series of breathtaking engagements with the enemy (apparently based on real clashes between Lord Cochrane and the French and Spanish in his sloop the HMS Speedy). These form the main body of the novel, which is wickedly episodic (oftentimes disconcertingly so), until circumstance finds Jack and Stephen made prisoners on the Rock of Gibraltor just before the climactic Battle of Algeciras in the autumn of 1801. How to resist this? Even if you have no clue what a ‘fake’ is, or which sail is the ‘topsail’, or which deck the ‘quarter-deck’, there is something compelling about it. (The idea of a sail ‘puddening’ particularly satisfies me…) O’Brian’s writing is ever active without being rough, detailed without being superfluous, gentile but never dull. All historical fiction should be this way: immersive, vivid, intimate, and yet also somehow alien and exotic, emphasising both our closeness and our distance from what is past. The thing that brings us in close in O’Brian’s case is characterisation, and particularly the fascinating, (dare I say charming?) friendship that springs up between his violently different principle actors. 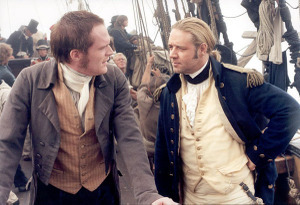 When Aubrey and Maturin first meet at a music recital, Jack is all uniform, flesh and vigour, pounding his fist up and down on his knee to the beat, while Stephen is ‘a small, dark, white-faced creature in a rusty black coat – a civilian…wearing a wig, a grizzled wig, apparently made out of wire, and quite devoid of powder’. Jack’s first impulse is to hit his cadaverous neighbour with a chair, while Stephen regards the Captain with a haughty disdain. Each intuits a man wholly and disagreeably unlike himself. Until, that is, the next day, when, meeting by chance in the street, they realise their mutual passion for music – Jack for the violin, Stephen for the cello – and a strange compatibility. ‘What is a hoopoe?’ cried Jack, staring about. ‘Indeed?’ said Maturin with a civil inclination of his head. Of course, Stephen’s passion for plants and birds and a hundred other things, is routinely thwarted by Jack’s sheer bloody-mindedness, or by his dedication to the ‘Service’, and the divergence of their final aims and ambitions seems set to become more and more of a wedge between them. But, for now at least, they go together: a strange companionship, but true. I honestly can't wait to read on - I have Post-Captain at the ready.